We've just rolled out an update to Hoop.la that adds a few new features. 1. Circles - previously, we had "permission circles" for managing groups of people for whom admins could assign specific permissions. We've made the concept of a circle much broader now. Circles are still groups of people in the system, but now they do not necessarily have to have any permissions associated with them. You can use circles, for instance, in recipes to group together people with no regard to permissions. Circles can be admin-only or viewable by the entire community. Thus, if you create an admin-only circle, only admins will be able to see that circle in any context. Just as with "permission circles", the new circles can have badges. And, don't worry, you do not need to make any changes to your permissions with this change. It just means that old references to "permission circles" will simply be "circles", but the members in those circles have not been altered with this release. We'll be expanding the ways you can view and use circles over time. With the new "invite-only" option, the only way for someone to join your site will be through a direct invitation. This setting is disabled by default. 3. Enhanced Alerts - now, alerts are supported for every type of notification in the system. Previously, they were only available for certain notification types. This gives your community members much more flexibility in the way they can stay on top of things! We've tweaked the way the personal notifications page works to make things a little easier to manage. There is a new tab on that page for "Settings" that handles your instant notification delivery method(s), as well as the suspend emails option. This is now the first thing you see when you visit your personal notifications page. The actual notification options "Primary Notifications", "Group Notifications", etc. are accessed via the other tabs on this page. As always, there were numerous other minor changes and bug fixes. For questions, please visit our support site. Thanks! I sure wish you would send emails to all the admins of your various Hoopla sites when you do a new release! I have had complaints all day about our members not getting email alerts like they used to. I was not aware that anything had changed! We need to know when these releases are published via another method than just a blog post here. I am now following this Blog, which may help. But a specific email alert about things like this would be VERY helpful. Agree. I missed this until just recently. Thanks, @Rich Melvin. We've been reading through that Would you mind creating a separate support topic to track this possible issue? I would recommend (as it sounds like you've done) that you subscribe to all new blog posts on this site if you'd like to keep abreast of new releases. We don't send out separate emails to site administrators currently to avoid duplication since many customers already follow the blog. 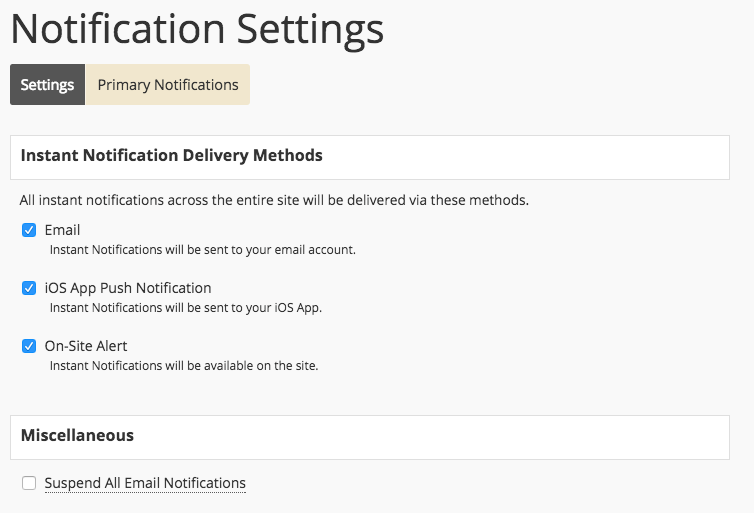 To confirm you set it up properly: you can set that up on your Primary Notifications settings here: just enable Instant Notification for New Blog Posts. As far as the specific issue your members are reporting, we will do some investigation to see if a bug made its way into this release. The notification email behavior for following should not have changed in this release. The Enhanced Alerts improvement adds support for new on-site alerts in addition to the existing email notifications, which should remain unchanged.